Saturday’s matches saw a dull goalless clásico in the Zona Sur between Lanús and Banfield, before the round sprung into life in Victoria with Tigre’s not really deserved 3-0 win over Quilmes. There were eleven goals in total, and six red cards, including one for Lanús manager Luis Zubeldía. 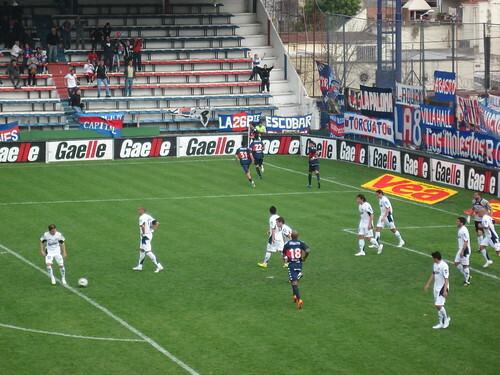 As well as Tigre’s first win of the season – for which I was in attendance along with Daniel Colasimone of Argentina Football World – Godoy Cruz also came from behind to leave Colón pointless at the normally formidable Estadio Brigadier General Estanislao López, and San Lorenzo brushed aside All Boys. You can watch all the goals right here, of course, as well as the main highlights from the Lanús vs Banfield match. Photo by me on Flickr – and you can join the HEGS Flickr group right here.